PARIS (AP) — When they played together for Arsenal, Thierry Henry and Patrick Vieira knew the importance of getting one over on local rival Tottenham. Scoring in the North London derby helped them become club legends, cementing their place in the hearts of fans. Of Vieira's 34 goals for Arsenal, none of them felt sweeter than when he scored against Tottenham. Same for Henry, who arguably got the best of his 228 club-record goals for Arsenal against Spurs — picking up the ball 70 meters from goal and carving through the midfield and defense before finishing with a powerful curling shot. Just like they did with France as World Cup and European Championship winners, the two prospered together for Arsenal and hit the ultimate height of an unbeaten season when Arsenal's "Invincibles" won the league in 2004. On Friday they will be on opposite sides as managerial rivals when Henry's struggling Monaco takes on Vieira's consistent Nice. Nice is unbeaten in six games and comfortably poised in seventh place. Monaco is one place above the relegation zone in 17th on goal difference alone. "We're doing breaststroke," said Henry, using a swimming metaphor, after Tuesday's 2-0 win at Amiens. "Sometimes we have our head underwater, other times we lift it up." Given how Monaco rarely fills its 18,500-capacity stadium, Friday's match won't quite match the frenzy and fervor of the North London derbies of old at Highbury and White Hart Lane. But this match nevertheless has a derby feel to it, with the local sides just 20 miles (32 kilometers) apart on the French Riviera. 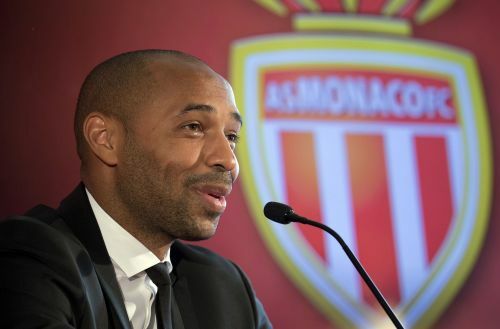 "I know what it's like, I've already played in it," said Henry, who started his glittering career as a prodigious teen with Monaco in 1994. Henry used to love scoring against Spurs, but his players will have their work cut out doing so against a Nice side which has kept a single-season club record of six straight clean sheets heading into this game. As a strong and fiery midfielder, Vieira offered a protective shield to his defense. Those same combative qualities are now apparent in a Nice side which — although lacking firepower — has the fourth best defensive record in Ligue 1. But Radamel Falcao's return to form will give Vieira a headache. Falcao scored twice against Amiens to take his tally to seven in 14 league games. Although both were penalties, the Colombia striker's sharpness and movement were the best they have been in a turbulent spell for Henry's Monaco. Since taking charge in mid-October, Henry has won only two of 10 games — both against teams hovering around the relegation zone. There have been some awful performances — notably a 4-0 home defeat to Club Brugge in the Champions League — but Henry has also dealt with a huge injury crisis. He has been forced to pick teenagers with no experience while battling for precious points. Paradoxically, this is starting to have a positive effect and a semblance of team spirit — so lacking earlier in the season — is slowly becoming apparent. It also highlights the remarkable strength of Monaco's notoriously good scouting network, which produced France star Kylian Mbappe. Against Amiens on Tuesday, French football got a glimpse of the immense potential of 17-year-old midfielder Han-Noah Massengo, whose quick feet, even quicker thinking, and boundless energy were priceless to a Monaco side desperate holding on at 1-0 before Falcao's last-gasp penalty made it 2-0. Falcao's first penalty came about after defender Benoit Badiashile— another 17-year-old — was upended after reacting quickly to a loose ball in the penalty area. Without Monaco's crisis, those two may never have got such an early chance to show their precocious ability. While Falcao is coming back into form, Nice striker Mario Balotelli's slump continues. Balotelli has not scored in 10 league games this campaign, a far cry from the previous two seasons when he top-scored for Nice with 18 and 15, respectively. A failed summer move to Marseille seems to have affected Balotelli's fitness and form. "Mario's lacking confidence, you can tell by the way he receives the ball," Vieira said. "We all need to get behind him: the club, the fans. We have to put him in positions where he gets his confidence back. He's very important for us." Key players from the 1998 World cup winning France team - Where are they now?